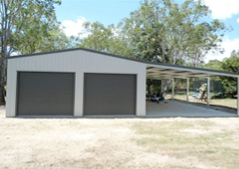 Lockyer Sheds can design carports, garages and residential sheds in Brisbane, Toowoomba, Warwick & Goondiwindi and everywhere in between. 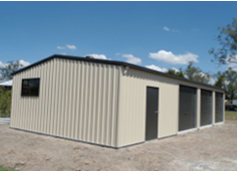 All our buildings are engineered to meet all the requirements of the Australian Institute (ASI) 2009 design code and are ShedSafe™ Accredited. 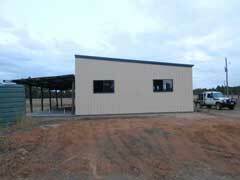 After more than 18 years installing steel framed buildings, we have the experience and skills to look after your job. Our residential garage sheds come in just about any size you can imagine with spans to suit domestic designs. We can build a garage to house your cars, boat, caravan or create somewhere safe and dry to park your bike. Whatever your need may be, we’ll look after you. We offer a range of Bluescope™ Colorbond™ colours to choose from and cladding options to suit the specific style of your home and ensure that the finished product adds value to your property. 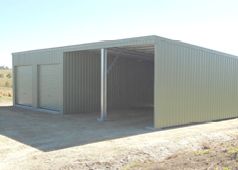 Adding an awning to garages and residential sheds Brisbane, Toowoomba, Warwick, Goondiwindi and similar areas will give you more flexibility and freedom for economical storage. You can choose to have the awning as a roof-only solution or choose to enclose part or all of the awning for extra protection and peace of mind. You may also want to consider adding extras such as windows, personal access doors, insulation and ventilation to create a more functional space. Whether it is a single garage, multi-car garage or a workshop, we can help you to create a design that is right for your needs. With our innovative design and quoting software, we’re able to quickly customise just about anything that relates to the design of the building. Achieve a modern, designer-look shed that will complement your home or property. Our Modern Man Cave™ shed designs make all the difference when the look and style of your shed are what really matters. The garaport offers the best of both worlds – a secure place to store your belongings and a carport style cover attached to your shed providing a strong, safe place to park your car, bike or caravan. 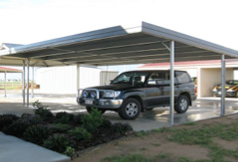 Our range of carports at Lockyer Sheds gives you the choice of classic gable carport and heritage style dutch gable as well as economical skillion style carports and awnings. All of these options will give you a strong structurally sound building that offers shelter and cover from the elements while remaining cost-effective to install. 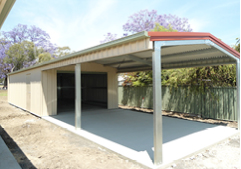 Custom designed carports, garages and residential sheds Brisbane, Toowoomba, Warwick & Goondiwindi. We can design to your specification, depending on what your needs are. We can also give you a more extensive choice of cladding finishes such as horizontal corrugated cladding or for a more classic look, you could try the M-Panel weatherboard look cladding. Additionally with our own in house engineers and design team we can build you a shed with eaves and gable extensions. 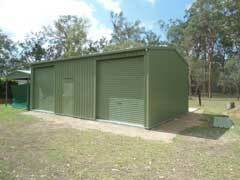 All of which will ensure that your custom shed is precisely the way you want it.